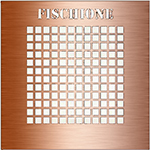 This 1.5mm square, 300 mesh grid is made from copper and is for use with Fischione tomography specimen holders. The size allows for further tilt in TEMs with small pole piece holes. An identification mark and the square shape give easy reference when rotated past 90°.